Looking at Minimalist sculpture today is to brave reassessment of the work as comatose and antiseptic. In the context of a slightly crazy cosmology, John McCracken brings life and spit to an evolving iconography. McCracken, presently recognized as an early contributor to Minimalism, furthers his West Coast orientation of the aesthetic in his third exhibition with David Zwirner. The now New Mexico-based sculptor overcomes tired design elements with a dedication more to strangeness than perfection. Taking up the “columns” and “planks” central to his sculptural vernacular, McCracken also overcomes outmoded clichés of universality with a thematic foundation of present-moment extraterrestrialism and pop parapsychology. McCracken himself executes the highly exact resin-on-wood process that results in imposing, reflective blocks suggestive of solid color. It is as if pure color were the material—an intention that McCracken has iterated. 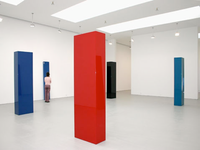 McCracken’s “columns” stand upright: mysterious obelisks. The artist’s “planks” lean between floor and wall, indicating relationships between different times and dimensions.